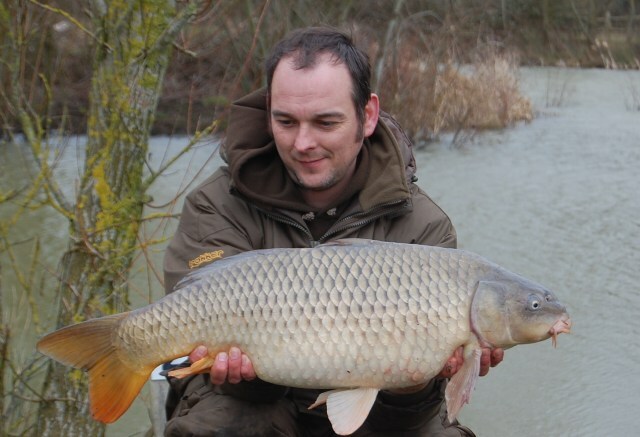 Saturday the 20th of March was the first time I set eyes upon Falkenvil fishery near Eastbourne in East Sussex. I left home early, just after 4am and arrived at the fishery at 5:45. I met up with Steve in the car park and we waited for the others. Sean and Danny turned up and we unloaded the cars and headed for the lake. It was quite a stroll to the water and I made mistake number one by bringing far too much gear. Half way to the lake I came across a bridge with narrow railings either side, I had to unload the barrow, carry all the stuff to the other side including the barrow and re-load it all again on the other side. A great start, I was knackered before I had even started!!! 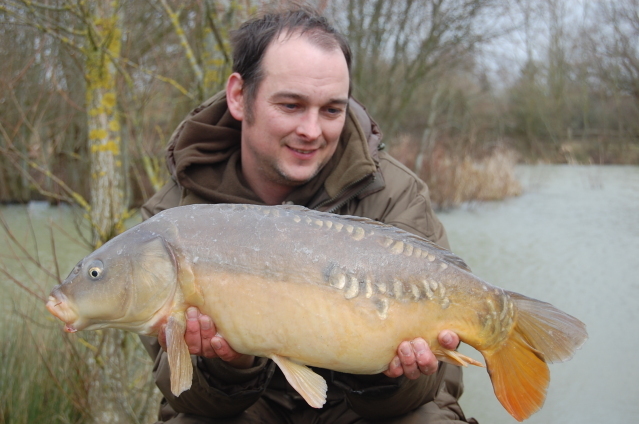 I set up in peg 2, there was an island in front of me around 15 yards away and plenty of snags, just my cup of tea. I would have liked to fish one of the longer chuck swims but there was a hacking cross wind which would have made accuracy difficult. I put 2 baits in front and one alongside of the island in front of me, 2 of the rods had popped up corn fished with bags of pellets and the other had boilie, I scattered a few freebies over all the rods along with some Hemp and sweetcorn. At around 10:15 I had a take on my middle rod, I looked up to see the rod bent round to the left, I jumped up and bent into what felt like a decent fish. After a spirited scrap I slipped the net under a mint 18lb Common. I was made up, a fish early and on my first trip. After the fish was photographed and returned I repositioned all the rods and applied some more freebies. Funny enough the rod on the boilies did nothing all day, it was the popped up corn with small bags of pellet attached that had all the liners and takes. I did get another take soon after, the bobbin on my left hand rod shot up so fast I thought it was going to chip the rod. As I got to it the bobbin had dropped again, I hit it but there was nothing there. think that it could well have been a better fish, this was confirmed when Steve and I saw a large pale shape sitting just under the surface for a minute or two, as if it was sulking there for a moment before finally swimming away. It looked very long and could well have been one of the Grass carp that reside there. Six Oclock and it was time to start packing away, all was going well until the heavens opened and drenched us all. Everything was soaked and the worst thing was that as I got back to the car the rain stopped!! But do you know what... I wouldnt have it any other way!! !